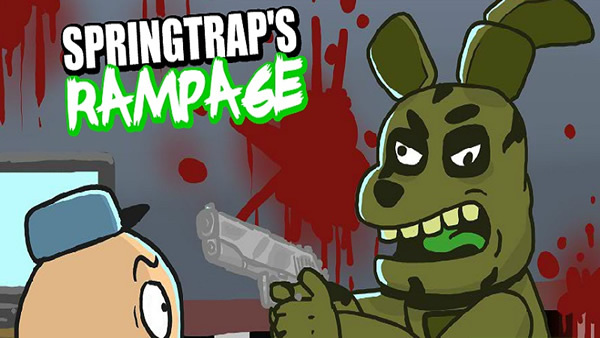 Springtraps Rampage is fighting-shooting game. It’s mini game. That comes from the original game “Five Nights at Freddy”.In which you need to survive for 5 nights shift in the pizza place. In this fighting horror game you are now playing as a one of the robotic creatures. Animatronic from “Five Nights at Freddy” at which you defending the pizza place from them. Now he is decided to go on rampage. Kill every guard using all kind of weapons that you can pick up like. pistol , revolver, magnum, automatic rifle. Shotgun, sniper rifle, machine gun, bazooka, rocket. And burn the place to the ground. If you are fan of Five Nights at Freddy. Then you will enjoy in this mini game fighting horror game. This game is fan made game so it have a lot of comedy and parody mixed with blood. and little horror in the game making it very fun horror game. All guns in this game revolve around a new “projectile system”. Meaning that you no longer need to click on enemies in order to kill them. Some enemies will require certain weapon in order for you too kill them. Watch out for your energy because there is no health packs in this game. Use arrow keys for movement. Use Spacebar to Jump and “E” to collect items. In every next level there will be more guards that will try to kill you. With many different weapons and you need to defend yourself and kill them. Using all kind of weapons like axe or pipe and much more that you will be able to pick up during the game. Always aim for the head because in that way you will kill guards very fast and leave the bloody trail. Be careful because if you die, you will lose everything and start again from level 1. Once upon a time, there was a miserable robot named Spring Trap who was found within the walls. Monitored every day as the manager and his kids watched him. 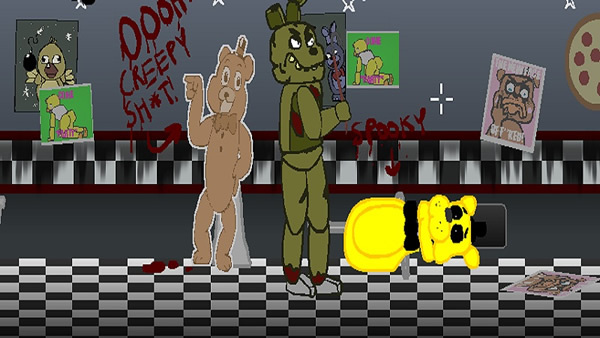 He is so busy at Freddy’s Fright. He could not do anything. It was not able use the potty even. He couldn’t talk with his friends. 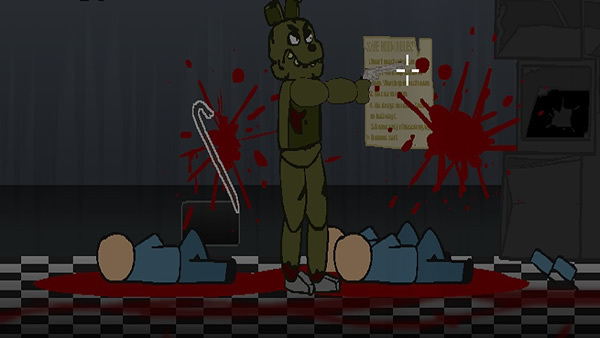 Springtrap finally had enough of this Show-Biz. And all of the sudden he meets Phantom Freddy in the Phantom flesh. 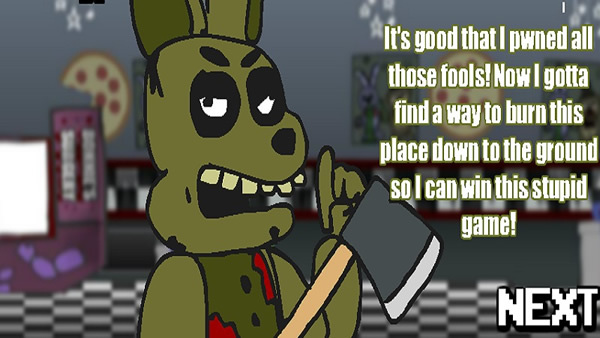 “What are you doing here?” asks Spring Trap. “I’am here to tell you that we need your help. We need you to destroy this place. We are stuck here” And he said that he will destroy the place and send it to hell! 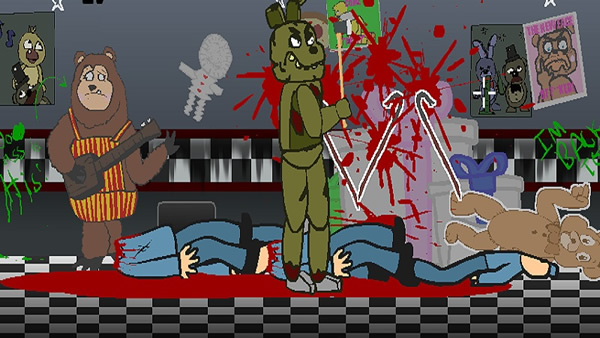 Springtraps Rampage is horror fighting game that is parody on the “Five Nights at Freddy”. Well known point click horror game. You can play it here online. without registration or installation. It’s also unblocked fighting horror game which means that you can play it from any place. If you like comedy games, funny games, parody games then this is the perfect example of such a game. During this game you will find a lot of stuff that you can use as a weapon. And of course a lot of guns too so if you are fan of shooting games then this is also great plus for you.